Ya know how they say that it takes more muscles to make a frown than it does to smile? This sitch is similar. Ya have your little drink and straw. As you’re getting into your car, you decide that you don’t want that cup .. maybe because your cup holder is already full of another cup from yesterday, crackers, a handful of McDonald’s napkins that you’re saving because this is cold season, etc, etc. Maybe you’ve become a mobile hoarder! 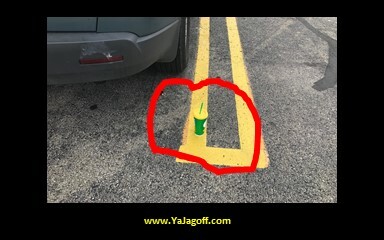 Soooooo.. ya just decide to chuck the cup but… you’re too lazy to walk back to a proper receptacle and ya know that throwing the thing down is gonna make a noise and draw attention to “who is littering?” So, you bend down and place the cup precisely in the camouflage yellow line! First: do you not know that actually is littering. OK, yeah, this stuff all over the ground in this parking lot, but, why do YOU have to contribute to the mess? Would you do this at your house.. in your living room? Second (and to the point I made earlier): Do you know that it takes more muscles to squat down and place this cup precisely on the yellow line than it does to walk this thing to a proper trash can? Ok, that’s probably not a fact but it sure sounded kinda like a “Bill Nye the Science Guy” type thing when I was pulling it together in my head! Put your cup in the garbage, Ya Jagoff!